Experts in home and closet organization—designers, architects, professional organizers and contractors—look to us here at Häfele for the solutions, trends and products they should be putting into homes and businesses. Our wide collection of unique home and closet organization fittings and systems will help create a more manageable closet space, regardless of the size. At Häfele, we have hardware solutions for any type of residential or commercial project. Whether you are looking for wardrobe tubes, baskets, or specific hooks, we have the perfect product for any job. Closets are no longer those dark corners of the home where no one dares to go. 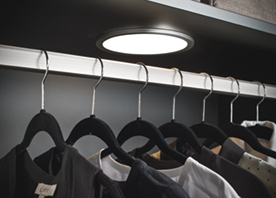 These are now vibrant, powerful statements often as stylish as the fashion they store—and Häfele’s Loox LED lighting system is just the solution to ensure you’re never afraid to know what lurks behind your closet doors. ENGAGE is a system of sophisticated, yet flexible components which can be configured for practically any space. 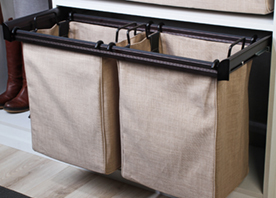 You’ll have no problem finding your stuff in style with standard full-extension, soft close drawers and pullouts. Some of the personal touches available include jewelry and watch organizers, shoe racks, hampers and much more. The ENGAGE system has reimagined the closet in ways which make all its components easy to install and even easier to love. 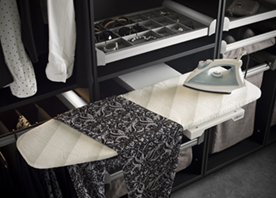 Also available in our line of unique, stylish closet organization systems is the Synergy Elite Collection. This collection includes tie hooks holding up to 24 ties, scarf hooks, belt racks, valets, and wardrobe tubes. Available in a variety of finishes, we’ve got organizers to fit any décor or style. 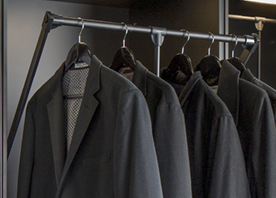 The Omni Track® collection features a unique selection of wall-mounted tracks and hooks for the closet. 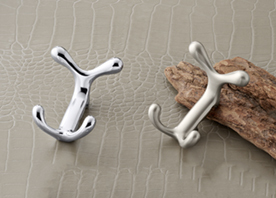 With our belt, tie, coat, and bracelet hooks, everything has a proper home. 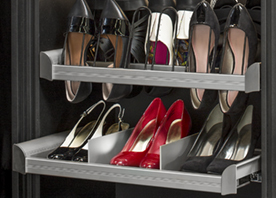 Combined with the Omni Track® hook mount, and you’ve got endless combinations of ways to organize a closet. Your clients will love the versatility the system provides. You’ll love the easy installation. We have a wide collection of carefully crafted wardrobe tubing available for a variety of applications—both commercial and residential—many of which reduce noise all while preventing scratching and giving lasting beauty and functionality to the space. Mounting hardware options include standard wall fittings as well as suspension fittings which make wardrobe tubes appear to float for a sleek, sophisticated look.